West Africa’s biggest night in fashion is finally here! And as expected, some of the most important names in style will take the red carpet in seriously chic attire. 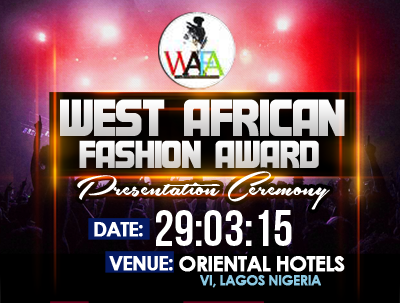 Really, all eyes are on the West Africa Fashion awards to be hosted in Lagos at the Oriental Hotel on the 29th of March, 2015, the ceremony honors the most forward-thinking designers, models and plain ol’ good dressers who have made an impact across the pond. The “West Africa Fashion award” is a ceremony to be held annually in the West Africa to showcase West African designers and present awards to those who have made the most outstanding contributions to the fashion industry during the year. The main awards include that of Menswear Designer , womenswear Designer, Fashion Event of the year, Style award and Outstanding Contribution as well as awards to the ‘most-fashionable’ celebrities in various fields. The ceremony is organized by the Fashion Instinct and runs as part of West Africa Style Week each March. The event produced by Fame Mansions will see 18 categories awarded. here are the nominees .